Samskriya Foundation is a registered public charitable trust that works primarily in Government schools to improve the academic standards of the students. In this academic year,we are teaching Science with hands on experiments to over 15,000 students in 100 schools on a monthly basis. We are also teaching remedial English and Arithmetic to primary level children in 5 government schools in and around Chennai. 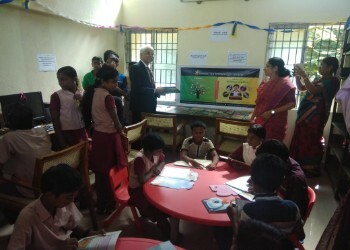 In order to expand the availability of good quality Science education to all children, we arranged free summer camps in 5 libraries in Chennai.With the overwheming response from students and parents,we decided to expand our successful Hands on Science classes to 9 public libraries in Chennai. On 6th October,Saturday,we plan to open the Hands on Science Classes to the Children in Erukkancherry Government Public Library in Chennai. We welcome you to our inaugural and support Samskriya Foundation work.